An air rifle, a gun cabinet and ammunition were discovered. POLICE IN NORTHERN Ireland have hit out at burglars who left weapons for children to find. 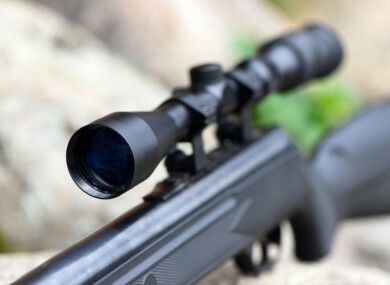 A air rifle that had been used in a burglary earlier this month was discovered yesterday morning on an area of waste ground at the rear of Jonesborough Market in south Armagh. A gun cabinet and ammunition were also found nearby. The PSNI have slammed the action as “despicable and dangerous”. These items had been stolen during a burglary in Lurgan, a town in the north of the county. Speaking about the weapon dump, Sergeant Sam Hoey said: “We are extremely fortunate that no one was hurt. I cannot describe the actions of a person who would leave a firearm where any member of the public could come across it. The fact that a child found it does not bear thinking about and we are grateful that no one was hurt. Anyone with children is asked to make them aware that if they come across any object that appears suspicious or dangerous they should not touch it and contact police. “Fortunately in this incident the children were able to do just that,” Sergeant Hoey went on. Read: Can you save money by doing the Christmas food shop in the North? Email “Police slam "despicable and dangerous" burglars who left weapon to be found by children ”. Feedback on “Police slam "despicable and dangerous" burglars who left weapon to be found by children ”.